And so it seems that the student strike in Quebec is slowing down and nearing an end, as the college – CEGEPs – in Quebec have voted to return to class, with roughly 10,000 students having voted to continue the strike, a far reduction from the 175,000 students that were on strike in late April and early May. The strike began in February of 2012 in opposition to a planned 75% increase in the cost of tuition. The students mobilized massive numbers, held mass protests, undertook picket lines at schools, expanded the issue into a wider social movement, and were consistently met with state violence in the form of riot police, pepper spray, tear gas, beatings with batons, being shot with rubber bullets, even being trampled by horses and driven into by police cars. The government enacted Bill 78, assaulting the rights to freely assemble and speak, and put a ‘pause’ on the school semester to end picket actions. Now that the school semester is starting back up again, and an election looms in the coming weeks, the students are being led away from the streets and into voting booths. The ‘Maple Spring’ has become the ‘Fall Election’. Meanwhile, in Chile, where a student movement that began in May and June of 2011, mobilized against a highly privatized education system, is continuing with renewed energy. There had been ups and downs of actions and mobilizations within Chile over the past 15 months, but in mid-August of 2012, the resurgence was seen as students began occupying high schools, blocking streets, and undertaking mass protests. Students who took part in the occupations were threatened with having their scholarships removed. In over a year of protesting, the students have not seen any meaningful changes to their educational system, or even inclinations that those in power were listening to their demands with anything other than disdain and contempt. The students have long been met with state violence, from the oppressive apparatus of a former military dictatorship, fighting an educational system which was established near the end of the military dictatorship. Riot police would meet students with tear gas, water cannons, batons, mass arrests, and other forms of assault. Police have subsequently stormed the high schools and arrested over a hundred students participating in the occupations. This caused the university students to get more involved, and they occupied the Universidad de Chile, which had not been occupied since the beginning of the movement the previous year (often known as the Chilean Winter). In Chile, as in Quebec, protests and marches and even the right to demonstrate are frequently declared to be illegal. In both Chile and Quebec, when protests erupted into violence (which is more often than not incited by the police themselves), these are called “riots,” and they are used in the media and public discourse to portray the movements as violent, extremist, trouble-makers, vandals, and criminals. This is designed to reduce public support for the protests (which was far more successful in Quebec than Chile), and to subsequently dismiss the demands of the students. There are, in fact, a wider variety of similarities and interesting comparisons between the Chilean Winter and the Maple Spring. Chilean students and academics have even expressed solidarity with the Quebec student movement. We face an issue here. The student movements don’t seem to be getting anywhere substantial in terms of establishing some sort of meaningful change. This is not to say they have not achieved anything; quite the opposite, in fact. The student movements have been successful at mobilization large numbers of people, organizing protests and indeed, in politicizing a generation, which is their most sincere and important success to date. Students have suffered under propaganda campaigns, violent repression, legal intimidation, and, most of all, the determination of an elite who view any and every minor concession as the ultimate unthinkable sacrifice which would ruin all of society. In short, elites are more stubborn than students could ever seem to be, and they have the means to hold their position and tire the students out if they can’t simply scare them away or crush them down. So, while symbolic actions and political radicalization are necessary achievements, the will to continue taking actions and the hope to manifest radical ideas becomes worn down, demoralized, and sapped of its strength. This is incredibly challenging to revive if the circumstances and courses of action do not change. So perhaps it is time for a new tactic. Instead of having radicalization follow mobilization, students could begin to have radicalization guide mobilization. For any social movement to advance, grow, and become something not simply demanding reforms, or demanding something from power, it needs to provide something to the students, to the communities, and the public at large; it needs to create. This is the difference between a reformist movement and a revolutionary movement. In this context, the word ‘revolutionary’ is not used to imply a usurping of state power and violent overthrow of authority, but rather to transform on a radical scale our conception and participation in specific or all sectors of society. Thus, it is essential to provide new ideas for action, rather than discussing and debating the new terms of capitulation. It can make all the difference between a question of how little students will get from their demands, to a question of how much we can get from a new educational structure itself. A discussion of new ideas must replace – or coincide with – the articulation of ignored demands. How is this possible? What might this look like? For students, the fundamental issue is education. For the student movements, growth came from expanding the issue into a wider social one, and linking up with other organizations and causes. This expands the scope, and thus, the base of support for a student movement. However, established unions played a large role in guiding (or attempting to guide), fund, and organize in cooperation with student movements. While the cause of workers is an issue that must be engaged with, the established unions that have survived to this point, roughly thirty years into the global neoliberal era, have survived only because they function on a basis of cooperating with the established powers of society, the state and corporations. They are corporatist institutions. Over one hundred years ago, unions were extremely radical, organized, massive, and revolutionary. The actions and ideas of radically organized labour were the impetus for 8-hour work days, weekends, pensions, job security, benefits, an end to child labour, and much more. Unions subsequently faced roughly a century of battering, violence, co-optation, and destruction. Those which remain are not radical, but only slightly reformist. I say ‘slightly’ because they do not mobilize to fight for new ideas or issues, but only to protect and preserve the reforms previously implemented as a result of radical labour agitation. Thus, union representative serve as a buffer for the blunt force of the state and organized capital and corporate interests which consistently seek to undermine and exploit labour. The major unions typically serve to soften the blow against workers as the elite bring down the hammer. Under this system, all rights, benefits, security and protections are slowly and inevitably worn down and thrown away. When the established unions provide funds and direction for the student movements, they tend to steer them away from radical or revolutionary paths, and promote a highly reformist direction, and which can only be undertaken through negotiation with and capitulation to the state and corporate interests. This gets us to where we are. When it comes to engagement and interaction, solidarity, and cooperation with labour, it should, in fact, be the more radical – and radically organized – students who lead the unions back to a more radical direction, to take them back to their origins when they achieved successes instead of softened failures. If they refuse to follow a radical direction, then students should encourage and attempt to find means of supporting the organization of new labour organizations: provide assistance, direction, ideas and physical and moral support. Students could be mobilized into the streets for workers’ rights as well as educational rights. The main point here is that for a movement to radicalize and become revolutionary, it must cooperate with, support, and be supported by other radical and revolutionary organizations and movements. If the more dominant force is reformist, established, and corporatist (by which I mean its functioning ideology is accepting of the state and corporate dominated society), then these organizations will attempt to co-opt, direct, and steer your movement into an area ‘safe’ for the elites, if not altogether undermined and eliminated. It is not necessarily done out of an insidious desire to destroy your student movements, but rather the result of an insidious ideology embedded within the very functions of their organizations. Thus, integration, mutual support, dependency and interaction with other social movements must take place at a radical and revolutionary level if you are to sustain that potential and desire within your own movement. It’s unfortunate, because it’s more difficult; but it’s true, all the same. Therefore, what is required are radical ideas of organization: for the student associations and other associations they interact with to be more accountable, directly, to their constituents. Instead of elected delegates or representatives making all the decisions (which is how our governments function), the decisions must be made by the constituents, and the representatives merely carry them out and organize accordingly. The student associations in Quebec and elsewhere function more along these radical lines, while labour and other groups typically do not. If student associations do not function in this manner, that is the first issue which must be addressed: either demand the associations to change, or create new ones and thereby make the unrepresentative ones obsolete. Thus, for a student movement to become revolutionary, the first step is the radicalization of organization. Now onto something more interesting: how to radicalize ideas and actions in education itself. This next step is about the radicalization of action. While the first step, in many instances – the radicalization of organization – had been achieved in several of the student movements, the actions themselves lacked radicalization. The actions were largely confined to mass demonstrations, picket lines, school occupations, and youth rebellion against state violence and repression. These are all important actions on their own: establishing solidarity, power in numbers, a public presence, a demonstration of will and power, the development of ‘self-esteem’ for a social movement. These are necessary, but if the actions do not evolve, the movement itself cannot evolve. Thus, what is required at this point is a discussion of new ideas of action. Typically, as is the case at the moment in Quebec, students are being told to stay out of the streets and go to the voting booth, where “real” change can be made. This is illusory and useless. Unless there is a radical party, the best that can be hoped for is to delay the inevitable assault on education, or perhaps achieve a minor concession, which would likely be more of an insult than incentive. New ideas of action must come from the students themselves, and there are a number of initiatives that could be discussed and undertaken. Fundamentally, instead of demanding from power, create something new. If education is what you want, begin to do it yourselves. In the case of a school occupations, why should the students not simply begin to have discussions on issues, share knowledge, invite professors, academics, and others who are supportive of the movement to come talk and share their knowledge? This does not need to only take place in occupied schools, though that would be quite symbolic, but could essentially take place in any public space. It would function as a type of grassroots educational system, designed to share and expand knowledge, not to prepare you for the workforce. Job opportunities are already vanishing everywhere for youth, and they will continue to do so as the economic crisis gets worse. These types of educational forums could potentially be designed to educate and share knowledge on issues of relevance to the student movements themselves: the history of education, protest and social movement history, political power, repression, the economic system – Capitalism, neoliberalism, etc. This could – and should – expand into much larger issues and areas of knowledge, including arts, the sciences, philosophy, etc. There are already people within society who have gained their knowledge through educational institutions, and thus, there are already people from whom to draw this knowledge from in a new forum, and in a new way. To give an example, imagine a ‘class’ (or forum) on the history of social struggles. First, a physical space is required, so to set up in a park, public venue, rent a space, or occupy a space (such as a school lecture hall). The students should have previously discussed – likely through social media networks – which intellectuals and individuals they would like to invite to come speak to them about the issue. The invited speakers would share their knowledge on the history of social struggles, promote discussion, debate one another, and engage directly with the students. For every invited outside speaker, a student should be invited to speak also, to share their own knowledge and engage on an equal basis. The notion that students are there only to learn and not teach is an incorrect one, and it’s a misnomer that should be addressed and acted upon. The public at large should also be accepted into these educational forums. The point should be to expand knowledge and discussion among the general population, not merely the students. But the students are the ones capable of providing this forum for the population at large. To add to this: such forums should be broadcast through social media, filmed and recorded, watched online both live and archived. Students could organize ‘subject collectives’, perhaps having a group of students organized along the lines of the larger student associations (through direct democracy), who would oversee the organization of each subject or issue: history of social movements, political economy, media studies, etc. Each ‘collective’ could establish its own website, where the wider community would be encouraged to engage, support, recommend speakers and issues and venues, watch archived or live-feed forums, debate in online forums, be notified of events and speakers, and be provided with educational material, reading sources, etc. The students could write papers which would then be posted publicly on such sites, to promote discussion and to actually use the knowledge instead of writing papers for a grade, which is a rather absurd notion. These sites could have news sections, providing relevant news and developments from around the world related to their issue. The collective itself – both within the community and online – then becomes a forum for the development and extension of knowledge to a much larger sector of society, locally and globally. This is where the actions become even more important. For a social movement to survive and expand into a revolutionary movement, it must not isolate itself, and must engage and interact directly with the wider population. The best way to do this, and one which has the added necessary effect of increasing the movement’s support among the population, is to provide a service or need. In the case of a student movement: that need is education. Merely ‘opening up’ forums to the public may not be enough. Students or ‘subject collectives’ could individually organize smaller meetings and discussions, in neighbourhoods and venues all over the city, region, or country, where students themselves speak with and to the public on issues in which they have been getting their education. This type of tactic would especially have to be employed within poor communities, and oppressed communities, where students would have to be willing to listen and learn more than they would be inclined to speak and teach. This is because many student movements, simply by their position as being students, generally come from a more privileged sector of society than the really poor, minority, immigrant, or otherwise oppressed communities. These sectors largely remain in the sidelines of the student movements themselves. This must change, and for a very fundamental reason: there is a great deal to learn from these communities. Oppressed peoples have experienced and known for a much longer period of time what the majority of students are only just starting to learn and experience: the true nature and interest of power, the violent and oppressive state apparatus, the underbelly of the economic system, the reality of social existence for a great many people. In short, it would be a means through which to educate the students on deeper issues of social strife, by listening and speaking directly to and with those who exist within oppressed social spheres. But there cannot be any taking without giving. So while oppressed communities may perhaps be willing to share their own knowledge with students and engage in discussion and debate, the students must provide something back to these communities. There is a very simple way to get this started: ask them what they need most in their communities. For example, if one community cited the cost and quality of food as a central issue, students could then leave the first meeting with the community with the intent to organize and plan around this issue. The students could hold their own discussions, meetings, debates, and share ideas on how to help resolve this specific issue within that specific community, and then propose various ideas to those community leaders. The ideas would be subject to critique, dismissal, support, etc, to go back to the drawing board with new suggestions or to get to work, putting action to the ideas. So with the issue of food, for example, students could perhaps organize around the idea of establishing a community food garden, proposing it to the community, and, if approved and critiqued, they could find an area of land, get the support and materials they need, and work with members of that community to plant and establish such a garden, to help move toward some form of food sustainability, provided either free or cheap to those within that area. Potentially, there could be a student educational association which specialized in sharing knowledge about nutrition, horticulture, etc., and they could be brought in to share their knowledge, help in the endeavour, or even make it a staple feature of their functioning: to go to different communities to help establish food sustainability. These are, of course, just ideas of actions, there is no reason to follow this specific outline. This is meant to merely promote the discussion of this concept: the actions, organizations, and objectives which would result from a radicalization of action are likely to be far more varied, interesting, and effective than these mere suggestions. However, I used these examples of actions and ideas to show how a student movement protesting against something (such as a tuition increase), can become a revolutionary movement for something. These actions are revolutionary because they force people to question and reconsider their conceptions of education, its manifestation, its purpose, its institutionalization, philosophy, etc. The actions themselves engage directly with people, drawing from and providing to the population as a whole. This increases support among the population, but also greatly strengthens the ideas and actions of the students themselves. At such a conceivable point, it could not be called a ‘student movement,’ but could only be identified as a much wider social movement, which would help radicalize the wider society itself, which would in turn provide new ideas and actions to the students; solidarity in both words and actions. These actions are revolutionary because they attempt to maneuver around power structures instead of expending all of their energy on directly battling the power structure itself. By going around the power structure – around the state, the schools, the corporations, etc. – the students would create a parallel educational structure within society, making the existing one increasingly obsolete. As this is done, the bargaining power of the state and other structures is reduced, because the students no longer rely exclusively upon them for an education. The state would most certainly attempt to repress such a movement, or perhaps even to offer much larger incentives, concessions, or even meet the previous demands of students in order to get them back in the schools and within an educational system that power controls. The state is well-established to deal with direct confrontations: that’s what police, armies, guns, badges and lawyers are for. It doesn’t matter who you are, what you’re demanding, or where you are demanding it, the state can simply tear gas you, scare you, disperse you, and wait you out. But to move around the power structure, and to create and establish something new, not under the control or direction of established institutions of power, the power structures become very nervous and insecure. It would be foolish to think that the power structures would not respond with more state violence than they have up until present, they most certainly would. The primary difference, however, would be that the public support for the movement would have conceivably exploded, and in the case of increased violence, it would explode in anger and opposition to the state. In short, while the state would be likely to increase its tactics of intimidation and violence, the public response would likely be far more powerful than anything we have seen thus far. We saw an example of this in Quebec, when the government passed the repressive Bill 78 and a much larger segment of the population was mobilized in opposition to the government. However, this has now largely faded, and again, it’s about the difference between mobilizing against something and mobilizing for something. It’s the difference between opposition and proposition, demand and action. Students must now ask: Does it have to be this way? What other way could it be? What should change? How could that change? What is the intent of education? These questions lead to other, larger questions about the society as a whole, and, as a result, they make necessary the wider radicalization, organization, and revolution of society itself. It is a rather large idea, but I think it is also a logical one. As the economic and social circumstances for most people continue to deteriorate in the near future – and perhaps rapidly so as the global economic crisis accelerates – such ideas and actions will become all the more necessary and will generate much more support. 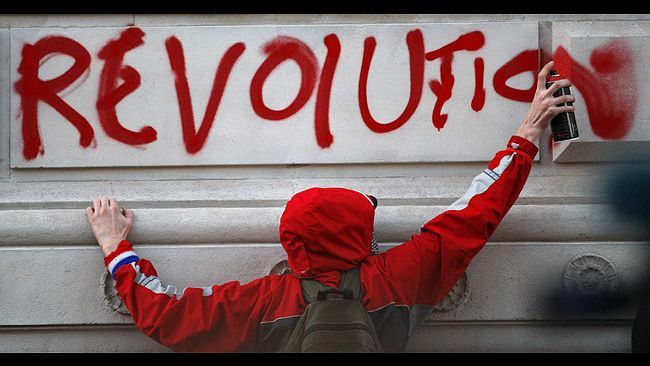 Since the beginning of the global economic crisis in 2007 and 2008, the world has seen a rapid acceleration of resistance movements, protests, and revolutionary struggles. The world is rumbling awake from a long lost slumber of consumption and consent as the situation of crisis reveals deep flaws in the structures, ideology, and actions of power. We are witnessing the rapid proliferation of global resistance movements, but it requires much more for them to become global revolutionary movements. It has only begun, but it requires new ideas and actions to move forward. It would potentially be very challenging to begin such actions now, but in the very least, student movements should begin to advance the discussion, to debate the direction, and to incite new ideas. These are, after all, the skills that an education is supposed to provide us with. Perhaps it is time to put our education to use. By Andrew Gavin Marshall in Canada, Culture & Society, Philosophy/Theory, Quebec Student Movement, Resistance/Revolution on August 18, 2012 . Andrew, — This savors of the Communist Manifesto. Terms like “radical” and “revolutionary” sound like 1848 and 1789, and most people will be turned off. Isn’t the problem that we have a system which attempts to make money by cand gain power by creation of debt? Isn’t the problem that private interests have subverted public monetary authority? If we are going to talk about necessary changes in fundamental principles, we can’t talk about revolution, because these kids haven’t got any idea how to run a revolution, as is evident from the fact that they lost control of their own movement last spring, and were manipulated by unions. By the way, the fall election in Quebec was not caused by the maple spring. If there had been no student uprising, Charest would have had to call an election, and his party would have either formed a minority government, or formed a coalition government with CAQ, or gone into opposition. — J. R. G.
I too had difficulty with the words “radical” and “revolutionary” as they, to me, are far more emotional than rational. The US history books promote the “American Revolution” while the British texts refer to the “American Rebellion”; both are correct. Whether one gets hung or not depends on victory. Essentially, what you’re arguing is that education need not come from the ‘education system’. Which is absolutely true. However, this underscores the fallacy of equating a ‘right to education’ with a right to expensive university schooling. A much more useful and beneficial revolution than that envisioned by CLASSE, Québec Solidaire and company, would be a revolution in the public’s perception of what it takes to be ‘educated’. Education is now seen as a series of very expensive hoops you must jump through in order to be considered ‘educated’, or properly trained for a profession. Allowing more and more students to pursue higher education has perversely resulted in lowering the standards in every university program I know of directly, with the possible exception of medicine. This further entrenches the view that someone lacking a bachelor’s degree can’t be all that educated – after all, having a bachelor’s degree is far from guaranteeing its holder is educated. Can anybody point to any instance where the Ruling Class ever gave anything to the Lower Class without the threat of violence? I don’t think anybody can. All this talk about peaceful protest is propaganda taught to us in grade school. Martin Luther King preached non-violence because he was being threatened with arrest for inciting riots. So he kept his powder dry. But, in the backgroud there was violence all over the American South. President Johnson introduced the voting rights act and other programs for minorities becuase protesters were bringing cities to a standstill. Does anybody really think that Roosevelt introduced the “New Deal” because it was “Kind To Animal Week”? There were huge protests and threats/plots to take over the Whitehouse. Before the New Deal was introduced, Eisenhower and Patton were sent in to set fire to the unemployed camps. Everybody talks about Ghandi and peace …. but when Ghandi was walking around with his hands folded in prayer, the British military was being attacked on every front. All this “Jibberish” about non-violence is sold to us as a “Religion” and it is all a myth. The Ruling Class never gave the Lower Class anything without the threat of violence. The reason that the RCMP became an important and indispensable asset to the Federal Government was because they “Excelled” at beating unemployed protesters in Winnipeg. Before that they were nobodies. All the social gains made during the 60’s and 70’s was because the Ruling Class were under threat. Without the threat of violence, the Ruling Class ignores you.